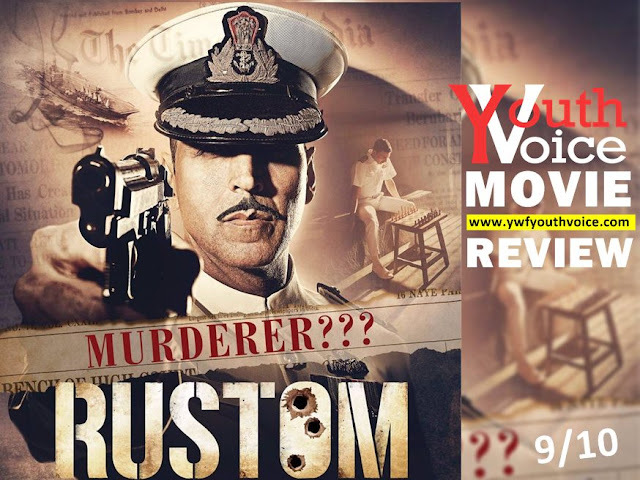 Rustom (2016) Full movie review including synopsis, good points, bad points, ratings for story, music, direction, editing, screenplay, star performances, overall and the final verdict. Story is set back to 1959, an Indian Navy Commander is accused of murdering his wife's lover. Whole story revolves around this murder case, role of newspaper, public, court jury and police is in main focus after the man Rustom himself. Rustom Pavri is one hell of character, patriot, killer or what? Akshay Kumar back in uniform, we all love him. Movie keeps interest alive till the very end, never lets you get bore. Storyline is gripping, very well written. Music not up to the mark. In fact it's below average for a Bollywood movie. Some flaws which makes this movie to rank below Drishyam. Direction could have been a little better. Must watch movie!! One reason not to watch this movie: if you're a Akshay hater then stay away as he is at his best. It's a family movie, will be fun to watch with friends too. Don't miss it!